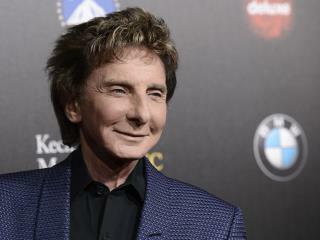 (Newser) – Barry Manilow had to scrap two tour dates this week after he was "rushed" from Memphis, Tenn., to Los Angeles due to complications from an emergency oral surgery he had on Monday, according to a post on his Facebook page. A publicist told CNN on Thursday that he's "perfectly healthy" and not in a hospital—it isn't clear if that's where he was initially taken—but may miss Monday's Grammys as a result; he's nominated for his album "My Dream Duets." Manilow needs to lay off of the plastic surgery, he looks horrible. I hope he makes it "Through the rain..."
What, did he have to have a large cylindrical object surgically removed?